Every year for the last five or so years I have put Stasiland onto my list of selections for my face-to-face bookgroup (AKA ‘The Ladies who say Ooooh’). Every year for the past five years, the year elapsed and Stasiland wasn’t chosen. Ah! But this year IT WAS!!! I was a little tentative about subjecting The Ladies to yet another of my gloomy selections after subjecting them to The Land of Green Plums about Ceausescu’s Romania last year- what would they think of the Stasi in East Germany this year? I need not have feared: the narrative was more straight-forward here, and having a young Australian journalist as the first person narrator introduced a familiar voice and viewpoint onto something that, fortunately, is not within the experience of most of us. Funder, working as a journalist in Europe after reunification, was first attracted to investigating East Germany when a request for a program on the “puzzle women” was brushed aside by the television producers she worked with. There was, it seemed, an embarrassment about the East Germans, as if it would all just disappear if no-one spoke about it. These “puzzle women”, she later discovered, were employed to reassemble the papers shredded by the Stasi as the wall was falling, a task that would take over 300 years at the current speed. Methodical to the end, the papers had been shredded in order and shoved into a bag together, and so it was possible to piece them together and reveal the banality and the all-pervasive intrusion of the Stasi into the lives of East Germans. In East Germany, it has been estimated, there was one informer for every six people. Some of the surveillance was the stuff of farce, like the ‘smell samples’ that purported to capture every individual’s smell for later reference. Other surveillance was more insidious: the reports that were given to potential employers who later changed their mind about the offer of a job; the insistence that there was no unemployment when, as a result of such reports, one could not get a job; the warning that a rock group singing subversive lyrics would no longer exist, only to disappear completely from all public view and hearing. Escapes that were thwarted, imprisonment, blackmail, and the withholding of contact for years with a sick baby on the other side of the wall- by such means the Stasi dabbled in one’s very soul. There was physical torture as well, but she broaches this only at the very end of the book. By this time the claustrophobia, vindictiveness and degradation of such minute surveillance seemed on a par with physical torture. But of course, such intrusion and cruelty leaves no physical trace. She comments on the memorialization- or more correctly, the distortion of memory regarding East Germany. She notes the way that East Germans distanced themselves from the Nazis immediately after the war, as if Nazi ideology had flowed from the West and engulfed them, then withdrawn completely afterwards, leaving them innocent of it completely. She comments on tourist industry that has arisen around the physical fact of the wall- the remnant sections, the tours- that co-exists with a nostalgia amongst some East Germans for the simplicity and security of a life without the bombardment of consumer ‘choice’ and capitalist pressure. When she places an advertisement seeking ex-Stasi operatives for interview, she encounters men holding onto the shreds of a Communist dream, in denial of reunification, and hopeful of the re-emergence of the Stasi. She finds men who have mounted their own museums to East German life; she speaks to others who have their own justifications for their actions which ring hollow and rather pathetic in a changed world. The stories of the Stasi operatives and their victims are important, because the Stasi’s reach was not so much in physical things but in the more intangible sense of safety, identity and autonomy. There is no museum to hold such things. I was particularly interested in this book because of the role of the narrator in it. It is not an academic book as such, and I was surprised to find notes related to specific pages at the end as there had been no footnotes to alert me to their existence. The narrator is front and centre in this book: we see through her eyes and filter through her consciousness. At times you need to read against her prejudices- for example, with one man who, as perfect East German man, was moulded this way through his own father’s well-founded fears and insecurities as a dissident, and was to a large extent, a victim as well as perpetrator. I’m aware of a trend in academic history, to make oneself part of the story as well, and to use one’s own doubts, questions, misconceptions and false trails as part of the intellectual journey. I can see its allure as narrative device, but I’m wary. Funder is not, though, offering this as academic history. She is upfront about her outsider status, and she documents rather than explains. It is powerful, chilling reading nonetheless. Timely, too, as we hear of the Egyptians gaining access this week to their files, many of which had been hastily shredded. Just as the East Germans before them, they are becoming aware of the size and pervasiveness of the secret police and the complicity of family and neighbours in their midst. This entry was posted in Australian literature, Australian Women's Writing, Book reviews, The ladies who say ooooh, Uncategorized. Bookmark the permalink. 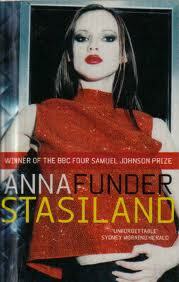 I’ve had Stasiland on my must read booklist forever. I will hesitate no longer. One in six were informers. There must be a lot of people in the old east feeling uncomfortable. How the world has changed since 1989. No doubt informers were informed on too. I am not sure that I would have had the strength of character to resist. I hope I would have. Yes it’s a sobering thought to look around yourself here and now and wonder which of the one in six people you come into contact with in your everyday life might be an informer. Do you think this work has any value as history? Would be of use to historians? I wonder how well she documented her interviews? It would be great, if she documented them well, if she placed them in a state or national library. I often talk about the “other matter” when I review nonfiction – indexes, footnotes, etc – but didn’t here. However, like you I was surprised and interested to see the little group of “notes” at the end.